Rachelle Ayala was a software engineer until she discovered storytelling works better in fiction than real code. 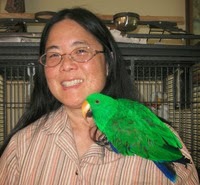 She enjoys writing love stories and has always lived in a multi-cultural environment. The tapestry of characters in her books reflect that diversity. She is an active member of online critique group, Critique Circle, and a volunteer for the World Literary Cafe. Check out her four romantic novels. Michal’s Window is a powerful, emotional journey as lived through the eyes of Princess Michal, King David’s first wife. Broken Build is a story of healing where a man learns to love and trust the woman who destroyed his life. Hidden Under Her Heart is a heartfelt love story combined with controversy over difficult decisions, and Knowing Vera is a suspenseful, cross-cultural romance mixing an unsolved murder, adventure, and hot, steamy love scenes. Visit Rachelle at: Website: http://rachelleayala.me Blog: http://www.rachelleayala.com or follow @AyalaRachelle on Twitter. Some secrets are best untold. Vera Custodio has never fallen in love, though she has strong feelings for her friend and sometimes lover, Zach Spencer. Long-forgotten memories resurface when Vera discovers Zach’s mother was the woman her father supposedly murdered many years ago. After losing his leg, former triathlete Zach Spencer reevaluates his life—and realizes he’s falling in love with Vera. When she ends their relationship, Zach is determined to prove his love and follows her to Australia in search of the killer. Caught between a web of family secrets and a deranged adversary, Vera and Zach must depend on each other for survival. Love blossoms, but the truth explodes everything Vera knows about herself. Will she close her heart forever or risk it all for a shot at happily-ever-after? Vera Custodio has spent most of her life avoiding getting close to anyone. She is haunted by memories from when she was 7 of seeing a woman murdered and her father taking her from the scene. He tells her to forget what she saw and never to tell anyone, and then he jumps off the Golden Gate bridge. Years later, she becomes friends with Zach Spencer, not remembering him as the little boy she played with or making any connection to the woman it is believed her father murdered. Then Zach is injured and his family comes to visit him in the hospital and Vera makes the connection; she is also sure Zach's father makes the connection. But what about Zach? Does he know? What about the strange emails she's getting from the dead woman and then from her father? How are Cliff and her Uncle involved? Just how tangled is the web of secrets and deceit? The story has multiple twists and turns, embedded in cultures, exposing the insensitivity of others toward individuals with prosthetics, and depicting the impact of loss of limb on even the strongest of individuals. This is the third in the series. It might be helpful to read to the first two in order to know the back story, but it can stand alone. On the other hand, once you read Knowing Vera, you know how the first two end. Although categorized as "Family Drama", as noted in the synopsis, Knowing Vera includes steamy and somewhat explicit scenes.